Hamilton, Grant E. “Massachusetts did it.” 1919 Nov. 29. Medium: 1 drawing : India ink over pencil, with black crayon on illustration board. 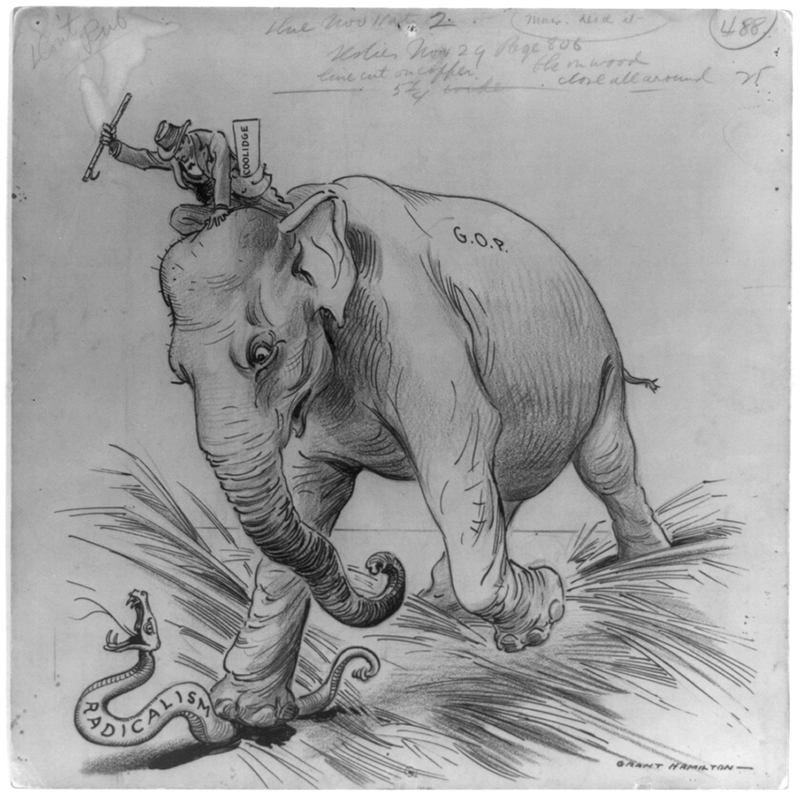 Summary: Cartoon showing Massachusetts Governor Calvin Coolidge riding atop a Republican elephant, stomping a snake labeled “Radicalism.” Notes: The image accompanied a Leslie’s editorial praising Massachusetts voters for reelecting Republican incumbent Coolidge in a state which generally supports Democratic, pro-labor candidates. The editors claimed Coolidge’s overwhelming victory against “the radical forces of the Democratic candidate,” was a sign of clear support for “Americanism,” equated with conservative politics. What is the definition of radicalism? Do you agree with the cartoonist’s choice to represent radicalism with a snake? Why or why not? Read the notes for this political cartoon. Do you think the elephant was a good choice to represent the G.O.P, or Republican party? Why or why not? Use the Primary Source Nexus search box to look for more information about Calvin Coolidge. What else did you learn about his political career?